Introducing Phyllopteryx dewysea, also known as the Ruby Seadragon, the first seadragon species found in over a century and only the third identified in the world. The original specimen was found off the coast of Recherche Archipelago in 2007 with three other specimens discovered in museum collections, misidentified like the original as Weedy Seadragons. Sporting brilliant red coloration – hence the common name – the new species possesses several skeletal and genetic differences that distinguish it from the Weedy Seadragon and the Leafy Seadragon. 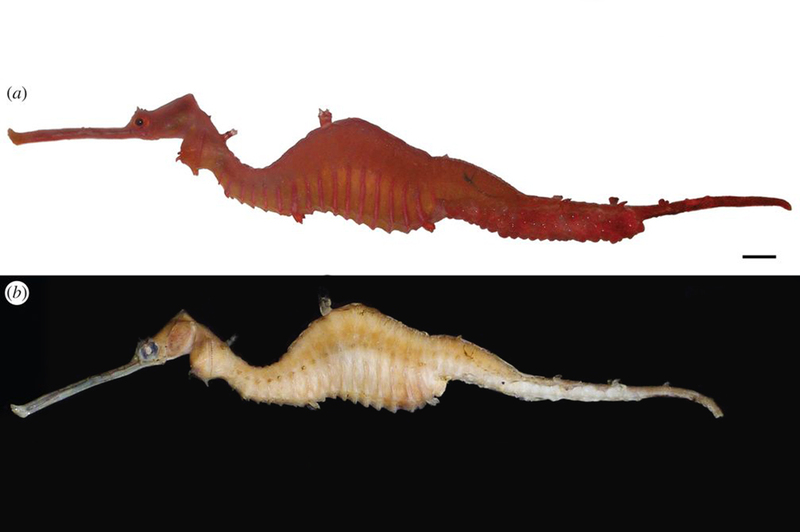 Although a living Ruby Seadragon has yet to be observed, researchers believe they will find them…just at slightly deeper depths than its cousins. This speculation rises from the red coloration which in daylight is hard to miss but at lower aquatic depths becomes difficult to distinguish. In fact, the bright color serves as camouflage, a tactic observed in many other deep-sea dwellers. Receive more Good News Review by following us on Twitter @tgnreview!